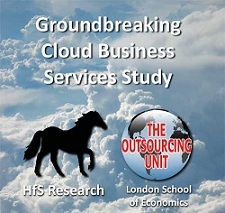 This week, we're beginning to unravel the colossus study we just ran with the London School of Economics delving into the future potential of Cloud Business Services. We managed to receive 1053 participants across business buyers, IT buyers, advisors, providers and industry influencers - if anyone else in the industry has performed such as exhaustive study of Cloud business services, please enlighten us! Thank you to all our loyal readers who completed the study, and our friends at SSON who helped engage their network. A complimentary report of the study findings will be winging its way to you all very soon. One of the unique angles of our study has been to contrast the views and intentions of the non-IT business community, and solely IT executives. And - as we suspected - the dynamics driving the future direction of Cloud adoption within the business functions is going to come from the business function leaders who "get it". *The ability to access business applications quicker, faster, cheaper and in a virtual business environment are the major drivers - and it's the business side of the house which is even more engaged by the potential value than the IT-side. *Most notably, half the business respondents seriously value the focus Cloud brings to transforming their business, as opposed to their IT. Barely a third of IT respondents were as enthralled by this. Does this mean that the real impetus behind future adoption of Cloud Business Services is going to come from business function leaders with heavy influence over IT spending for their function? And what role will Cloud Business Services play in altering the make-up of today's outsourcing and integrated services engagements? These results are really interesting; however, not too surprising. In the not too distant past a Salesforce.com sales representative would normally head in the other direction whenever someone from the IT group at a prospect/customer would head their way. 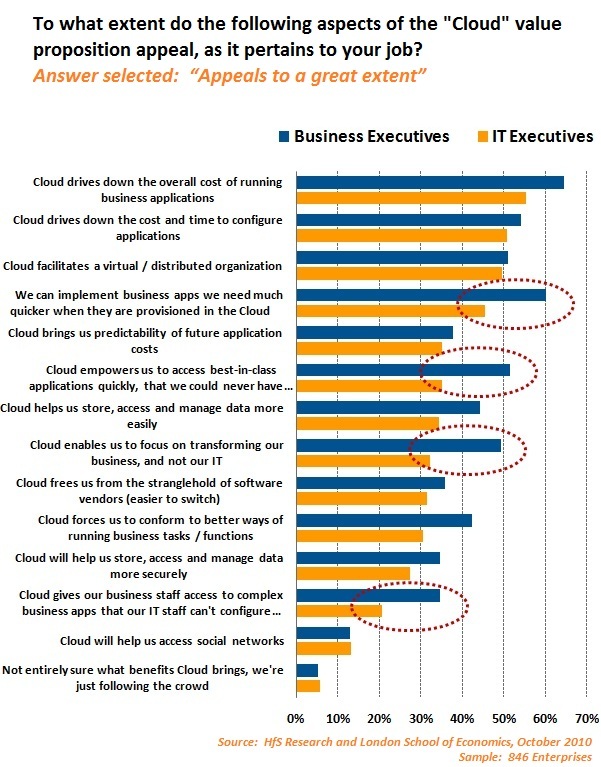 Line of Business executives have been way ahead of IT on Cloud adoption. It may be more surprising that IT responders are now closer to the sentiment of LOB. I look forward to seeing more results from your impressive study. This study and Ryan's point reaffirm that meeting the needs of the business overshadows whether that support comes from internal or external sources. I look forward to seeing the rest of the study. Thanks for posting the statistics – very informative. I agree that the business side will play a larger role in accelerating cloud adoption. You may also find my post interesting.